Tagline:Just when you thought it was safe to be dead. You can’t keep the dead down for good. 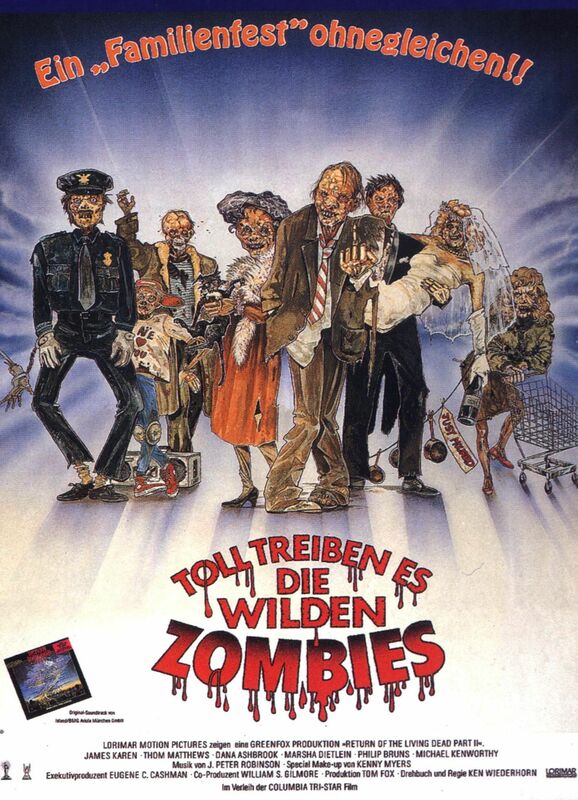 In 1985, writer Dan O’Bannon put an interesting spin on the zombie genre with The Return of the Living Dead. 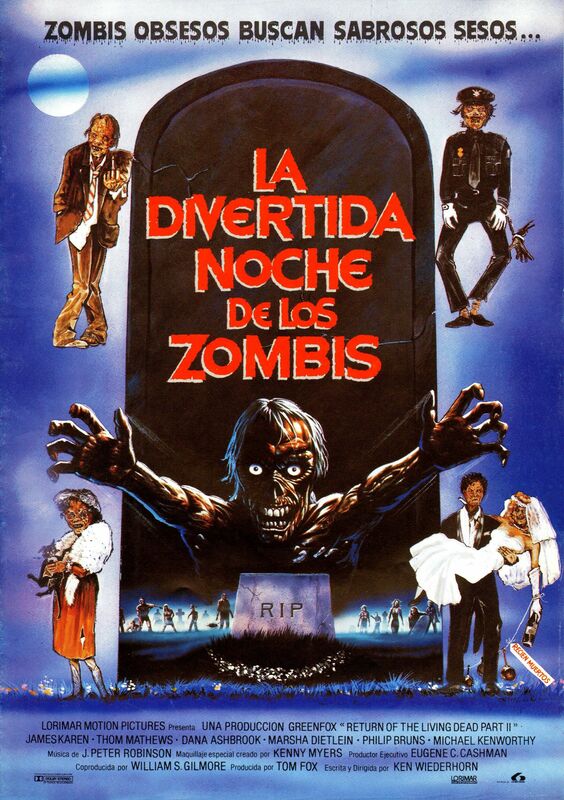 Mixing humour with horror and adding a dash of punk to the film’s style and soundtrack, Return satirized the films of George A. Romero by insinuating that Night of the Living Dead was based on true events. It also proved to be a capable zombie picture in its own right. While the ghouls of the Romero pictures devoured human flesh, O’Bannon’s zombies sought after brains. Plus they were smart, and could run, something that wouldn’t become a staple of zombie lore until 28 Days Later. With a great sense of energy, style and flair, as well as a killer soundtrack and memorable striptease by cult actress Linnea Quigley, The Return of the Living Dead was a smash hit upon its release in August of 1985. Of course, when a movie is a hit, the possibility of a sequel is bound to come a knocking, yet producer Tom Fox ran into a snag: Dan O’Bannon didn’t want to do it. Dan O’Bannon on the set of Dark Star. He would also pen the screenplay for Ridley Scott’s Alien. The plot is a familiar one. On a dark and stormy night in an unnamed town, a convoy of military trucks are transporting barrels of the deadly chemical 245 Trioxin. Like any responsible employee placed in charge of such a potent substance, one of the drivers decides to smoke a little weed, unaware that the straps holding the canisters have loosened. When he inevitably hits a bump in the road, the barrels go flying and one of them rolls into a nearby river. The next day, a young boy named Jesse (Michael Kenworthy) is chased into a storm drain by some bullies and stumbles across the barrel. Naturally, the bullies think it’s a good idea to try and open it and lock a disagreeing Jesse in the adjacent mausoleum. In the midst of all this, a random trio of grave-robbers pull up at the cemetery with the intention of stealing the skulls of the bodies buried there, and one can’t help but realize that two of them are played by actors from the first film, but more on that later. The thieves in question, Ed (James Karen) and Joey (Thom Mathews), start their desecration spree by entering the mausoleum, allowing Jesse to escape. Unbeknown to Jesse, the bullies manage to open the canister, spilling the gas into the atmosphere and sending the cemetery’s reanimated corpses in search of suburban brains. Combining two genres is always a tricky proposition, because if the scale is tipped in either direction, it can set the tone of the rest of the movie. Comedy takes centre stage in Return of the Living Dead Part II; as the dead rise, we are treated to shots of them falling into empty graves or adjusting their clothing as they shuffle in search of brains. Later, there’s a sequence involving a chatty, severed head with a Southern accent, and when the main characters try to outrun the zombies in an old man’s Cherry convertible, a clever ghoul has its hand severed, running amok and flipping Ed the bird as they drive away. To the film’s credit, such gags are rather inventive, but for every good joke there are three or four that fall short, like a Michael Jackson zombie who pops up, does a few dance moves, and disappears from the film altogether. 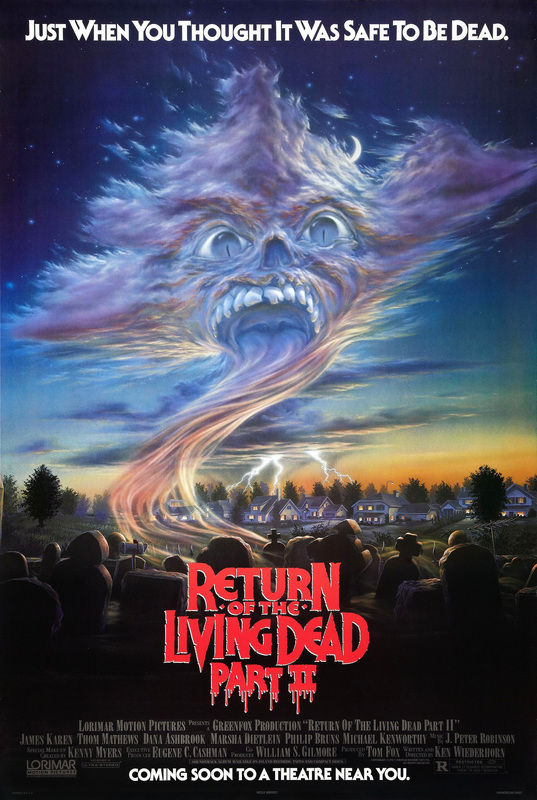 While the humour is indicative of the lighter tone this sequel pursues, Return of the Living Dead Part II’s biggest problem is its reliance on familiarity, so much so that the movie should have been called Return of the Return of the Living Dead. Many plot points, moments, and even character arcs are recycled from the original, with no unique twists to keep us interested. For example, Jesse encounters Return of the Living Dad’s Tarman when he returns to the cemetery to get the emergency number off the barrel, while an equally brief cameo from Colonel Glover (Jonathan Terry) is the only clear indication given that this is a sequel, and if you didn’t know this, you would assume he was just a general with a bad sense of deja vu. Breakdancing was all the rage back in the 80’s. Perhaps the movie’s biggest sin, though, is bringing back James Karen and Thom Mathews, only to have them go through the same motions, including Mathews’ character trying to eat his girlfriend’s brain once he turns. It also goes without saying that Ed, Joey, and his girlfriend Brenda (Suzanne Snyder) are the weakest characters, spending most of the movie screaming, screaming, and screaming some more. The remainder of the cast are fine, but lack the same spark of the characters from the original. Jesse is likeable, and though his youthful presence is reflective of the film’s lighter tone, he makes up for it by being smart and resourceful. There’s also a cable guy played by a pre-Twin Peaks Dana Ashbrook, who becomes the movie’s hero by discovering the undead’s one true weakness. Zombie looters would become a citywide problem. But the best character is Doc Mandel (Philip Bruns), a medical professional who’s more concerned with boozing than zombies. In the end, it seems we’re just as mindless as they are. A group of zombies ambush two soldiers, one of whom is played by Mitch Pileggi of The X-Files and Shocker fame. Though they fail to hold off the undead threat, some of the ghouls get the idea of going on a joyride, so they hijacking a military jeep and swerving around like your average Grand Theft Auto player. While driving through the city trying to figure out how to stop the zombies, Jesse attempts to pick up a signal on the car radio. He does, but the recipient is of the undead variety, and in a nod to the first film, he tries to lure their tasty brains back to the hospital. Fortunately, Doc saves them with this handy question. Return of the Living Dead Part II is an underwhelming but somewhat enjoyable follow-up to the original. It lacks much of the charm and wit of its predecessor, and is content with recycling stuff we have already seen. Thankfully, the movie isn’t a total loss, with cool make-up and some genuinely clever gags making this a pretty satisfying sequel.